Hemodialysis patients often do not attend their scheduled treatment session. We investigated factors associated with missed appointments and whether such nonadherence poses significant harm to patients and increases overall health care utilization in an observational analysis of 44 million hemodialysis treatments for 182,536 patients with ESRD in the United States. We assessed the risk of hospitalization, emergency room visit, or intensive-coronary care unit (ICU-CCU) admission in the 2 days after a missed treatment relative to the risk for patients who received hemodialysis. Over the 5-year study period, the average missed treatment rate was 7.1 days per patient-year. In covariate adjusted logistic regression, the risk of hospitalization (odds ratio [OR], 3.98; 95% confidence interval [95% CI], 3.93 to 4.04), emergency room visit (OR, 2.00; 95% CI, 1.87 to 2.14), or ICU-CCU admission (OR, 3.89; 95% CI, 3.81 to 3.96) increased significantly after a missed treatment. 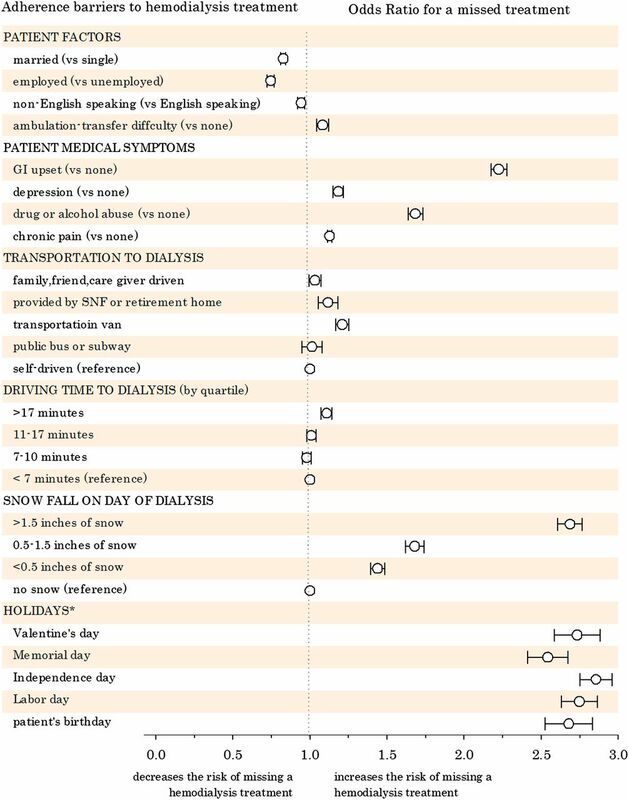 Overall, 0.9 missed treatment days per year associated with suboptimal transportation to dialysis, inclement weather, holidays, psychiatric illness, pain, and gastrointestinal upset. These barriers also associated with excess hospitalization (5.6 more events per patient-year), emergency room visits (1.1 more visits), and ICU-CCU admissions (0.8 more admissions). In conclusion, poor adherence to hemodialysis treatments may be a substantial roadblock to achieving better patient outcomes. Addressing systemic and patient barriers that impede access to hemodialysis care may decrease missed appointments and reduce patient morbidity. In this study, we identified missed hemodialysis appointments from a large ESRD cohort to quantify their effect on subsequent hospitalizations, emergency room (ER) visits, and intensive-coronary care unit (ICU-CCU) admissions. We used these results to test which systemic and patient barriers potentially impede patients from getting to their dialysis facility for treatment. A total of 44,586,241 outpatient hemodialysis treatments from 182,536 Medicare Primary patients were identified among 1463 Fresenius Medical Care North America clinics from January 1, 2005, to December 31, 2009. Within this cohort, the missed treatment rate was 1.8% or 7.1 missed treatment days per patient-year. The results showed that 34.5% of missed treatments occurred before the weekend (on Friday or Saturday) and only 9.8% of missed treatments were successfully rescheduled, in which a “make-up” treatment was delivered the next day. Generally, missed treatments were more frequent among younger and non-Caucasian patients (Table 1). We analyzed every hemodialysis treatment in the study population, and observed immediate increases in hospital, ER, and ICU-CCU admissions when a patient did not attend his or her scheduled treatment (Figure 1, Table 2). After a missed treatment, the probability of hospitalization was 5%, whereas the risk was only 1.2% if the patient received hemodialysis (adjusted odds ratio [ORadjusted], 3.98; 95% confidence interval [95% CI], 3.93 to 4.04). Similarly, the probability of an ER visit after a missed treatment was 5% and only 1.6% in patients who received hemodialysis (ORadjusted, 2.00; 95% CI, 1.87 to 2.14). For ICU-CCU admissions, the risk was 2% after a missed treatment and 0.5% in patients who were treated (ORadjusted, 3.89; 95% CI, 3.81 to 3.96). For ESRD-related complications, the odds ratio (OR) for a hospital or ER visit after a missed treatment, compared with an attended treatment, was even higher, at 6.39 for urgent hospital dialysis (95% CI, 6.77 to 7.10), 17.5 for hyperkalemia (95% CI, 16.6 to 18.4), 5.00 for congestive heart failure (95% CI, 4.84 to 5.16), and 4.62 for hypertension (95% CI, 4.47 to 4.78). 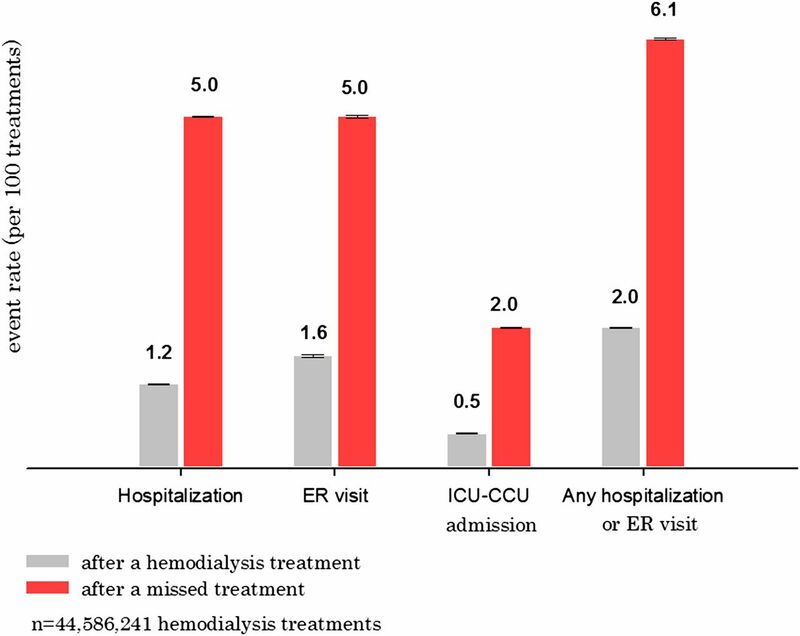 Increased immediate risk of hospitalization, ER visit, or ICU-CCU admission following a missed hemodialysis treatment. Patients may decide to miss their treatment because of a minor illness, such as an upper respiratory tract infection, which may predispose them to the subsequent risk of hospitalization. Consequently, we performed a sensitivity analysis in a subpopulation of patients in which we reviewed (blinded) nursing notes to identify missed treatments that were not attributed to a state of declining health. As such, we recalculated the risk of hospitalization, ER visit, and ICU-CCU admission in missed treatments attributed to transportation breakdown, personal business, clinic shutdown, and patients who showed up for treatment but left the waiting room before they were brought into the treatment area. The findings of these sensitivity analyses remained concordant with the initial conclusions of the study (Supplemental Appendix A). We also explored the statistical association between a missed treatment with 18 systemic and patient barriers that potentially impede patients from coming to dialysis (Figure 2). Patients who traveled to dialysis via a transportation van (OR, 1.21; 95% CI, 1.16 to 1.25) and who drive >17 minutes to the clinic (OR, 1.10; 95% CI, 1.07 to 1.15) were at increased risk to forego their hemodialysis. Missed treatments were also more prevalent when snowfall was heavy (OR, 2.68; 95% CI, 2.60 to 2.77),5 on any holiday (OR, 1.82; 95% CI, 1.79 to 1.86), and in patients with gastrointestinal upset (OR, 2.22; 95% CI, 2.17 to 2.28), depression (OR, 1.18; 95% CI, 1.15 to 1.21), drug or alcohol abuse (OR, 1.68; 95% CI, 1.64 to 1.73), or chronic pain (OR, 1.13; 95% CI, 1.11 to 1.14). Adherence barriers to hemodialysis care and their association with a missed treatment. Data points to the right of the vertical dotted line (OR>1.0) correspond to an increased risk for a missed treatment. *OR for any holiday, 1.82 (95% CI, 1.79 to 1.86). GI, gastrointestinal; SNF, skilled nursing facility. A patient-level analysis was performed to quantify the magnitude of hospital, ER, and ICU-CCU utilization as patients miss more treatment days per year. Using covariate adjusted Poisson models, statistically significant increases in annual hospital days, ER visits, and ICU-CCU admissions were noted with more missed treatment days (P for trend<0.001). On an annual basis, 10 missed treatment days associatively increased hospitalizations by 0.5 per year. Similarly, 10 missed treatment days corresponded to an additional 0.9 ER visits and 0.08 more ICU-CCU admissions per year (Figure 3). Increased annual hospital, ER, and ICU-CCU utilization rates for increasing frequency of missed treatments. In our final analysis, we estimated the excess morbidity attributed to systemic and patient adherence barriers (Table 3). Improving transportation to dialysis could decrease hospitalizations by 0.8 days per patient-year, rescheduling dialysis treatments that occur on holidays could decrease hospitalizations by 1.7 days per patient-year, and avoidance of snow days could decrease hospitalizations by 0.5 days per patient-year. Treatment of residual gastrointestinal upset, depression, drug or alcohol abuse, and chronic pain could decrease hospital admissions by 2.0, 0.2, 0.4, and 2.7 days per patient-year, respectively. Moving clinics more proximate to where patients live was unlikely to result in meaningful improvements in patient morbidity. Among 182,536 patients receiving chronic maintenance hemodialysis, we observed excess hospital, ER, and ICU-CCU usage associated with patients who missed their scheduled hemodialysis treatment. Further analysis of the data uncovered significant associations between increasing hospitalization and missed treatments with such factors as public transportation, inclement weather, holidays, and several other patient factors. These findings provide novel insight into the specific factors that may influence adherence to dialysis therapies. Within our large ESRD cohort, patients missed on average 1.8% of their scheduled hemodialysis treatments, which corresponded to 7.1 days per year when patients were off their schedule. More importantly, these missed treatment days were associated with more medical complications that required urgent hospital, ER, or ICU-CCU attention. Our study reports that there are substantial health risks associated with missing a hemodialysis treatment, and these risks appear larger than previously reported.6,7 Our study also suggests that there are specific modifiable systemic and patient barriers that may explain some of this excess morbidity. Whereas many quality improvement efforts have focused on advancing the effectiveness, coordination, and cost-effectiveness of medical practice to improve outcomes, we highlight barriers beyond the treatment, such as environmental and physical barriers found within or outside health care facilities, that strongly associate with tertiary care use. For example, patients with private transportation to dialysis (i.e., self-driven or brought by family member or caregiver) had significantly better attendance and outcomes compared with patients who relied on public transportation (i.e., city bus or transportation van). Patients were also more likely to miss dialysis and end up in the hospital if they were scheduled to dialyze on a holiday, on their birthday, or when the weather was bad. Such problems may be mitigated by increasing the use of home therapies, or developing treatment schedules that dynamically accommodate the lifestyle and limitations of each patient as opposed to fixed schedules designed to fit a 7-day week. Moreover, efficient rescheduling protocols could be developed that balance overall patient flow, but can proficiently reroute appointments to different locations or move appointments earlier or later in anticipation of a major snow storm or last-minute patient cancellation. In our study, only 9.8% of patients who missed their hemodialysis made up their treatment the next day. In addition, we uncovered multiple patient factors that may also impede adherence to dialysis therapies. Untreated depression, psychiatric illness, pain, and gastrointestinal discomfort also increased the risk of missing a treatment. As such, we recommend improving medical management in the areas of pain, discomfort, and behavioral health. From a patient standpoint, the findings that a missed treatment associated with pain and psychiatric illness provides a unique opportunity to improve hemodialysis adherence by managing coexisting comorbidities. Patients with ESRD have a high incidence of pain and depression that is mostly under-recognized and undertreated.8–11 Our results highlight the need to better identify and treat these conditions. We discuss some limitations of our findings. This study was observational and the covariates may not have adequately adjusted for potentially unmeasured illness when patients miss their treatment; however, we further validated the conclusions of the study in sensitivity analyses of missed treatments that occurred in patients who were not ill. We did have each patient’s date of death, but could not report accurate mortality outcomes because of potential misclassification bias. We could not determine whether a patient found dead after a missed treatment died before or after the missed treatment. Finally, there were some barriers, such as health literacy,12,13 that we were not able to include in the analysis because such data were not being routinely collected in the study population. In conclusion, poor adherence to hemodialysis treatments may be a substantial roadblock to achieving better patient outcomes. Improving accessibility to outpatient medicine can stabilize the course of ESRD and prevent its acute complications. We performed an observational cohort analysis to quantify the potential increase in hospitalizations, ER visits, and ICU-CCU admissions when patients go missing from their scheduled outpatient hemodialysis treatment. Our secondary analysis explored the association between a missed dialysis treatment with several systemic and patient barriers. The study protocol was approved and granted a waiver of informed consent by the New England Institutional Review Board. Data for the study were abstracted from the Fresenius Medical Care North America (FMCNA) ESRD database, which prospectively captures 1922 clinically pertinent and standardized data elements for the purpose of conducting large-scale outcomes studies in the FMCNA dialysis population. Over 1500 clinics in 48 states, the District of Columbia, and the Territory of Puerto Rico were represented in the database, which corresponds to approximately 30% of the United States chronic dialysis population. All patients registered in the database are followed longitudinally, in which data parameters are actively collected and entered at the point of care at each visit for each patient, which typically occurs three times per week. Demographic, comorbid, medication, vascular access, and dialysis treatment data are input by trained health care personnel into standardized electronic forms provided on touchscreen monitors located at every treatment station. The data collection tool includes predefined logic features and user alerts to check data as they are entered. Required fields are structured so that valid data must be entered before the system can authorize the hemodialysis treatment to begin. At the end of each dialysis shift, automatic edit checks are executed to identify inconsistent or out-of-range data that require immediate reconciliation by the facility charge nurse before the shift can be closed and submitted for billing. All laboratory processing was performed by a single accredited provider (Spectra Laboratories, Rockleigh, NJ) and the results were directly downloaded into the database. Data auditing occurs on the second week of each month when facility data quality reports are generated for assessment by FMCNA data quality managers. The reports are also disseminated back to facilities for auditing by the clinical manager and senior clinical staff. We identified all patients with ESRD and their individual outpatient hemodialysis treatments that occurred between January 1, 2005, and December 31, 2009, under Medicare Primary insurance. To ensure the accurate identification of hospital, clinic, and ER encounters in our study population, the primary data set was linked to Medicare Institutional and Physician/Supplier claims provided by the US Renal Data System; 98% of study patients were successfully linked to their Medicare claims. Every scheduled outpatient treatment session from 2005 to 2009 was classified according to whether the patient received his or her hemodialysis treatment or whether it was missed using data from the patient roster. A patient roster was generated for every dialysis clinic shift on each treatment day, for nurses to electronically record which patients attended dialysis. The roster data were the basis for reliable medical billing; thus, these data were routinely audited by compliance officers and external assessors for data accuracy. If a patient did not attend a scheduled dialysis treatment, nurses were obliged to chart the reason: missed, hospitalized, died, recovery of renal function, transplanted, or transferred to another facility. For this study, all “received” treatments were valid only if a corroborating BP or weight was charted at the clinic on that same date. A treatment was considered “missed” if no inpatient, ER, vascular access, or other dialysis (home, hospital, or other provider) services per Medicare claims were delivered on the date of the missed treatment. Patients accrued missed treatment days while they were off their treatment schedule. For example, a patient who missed his or her Monday treatment and got the next treatment on Wednesday would have 2 missed treatment days. A patient who missed Monday but then made up that dialysis on Tuesday would instead have 1 missed treatment day. We recognize that patients may not be at their scheduled hemodialysis treatment because they are seeking emergency medical care or are deceased. As such, patients could not receive or miss an outpatient treatment when they were hospitalized or in the ER. Similarly, we could not determine whether a patient found dead after a missed treatment died before or after a missed treatment. Consequently, patients were censored from the analysis when they died. The primary outcomes of the study were hospitalization, ER visit, and ICU-CCU admission identified from the Medicare Standard Analytic Files (see Supplemental Appendix B). Primary outcomes were reported at both the treatment and patient levels. At the treatment level, the risk of a hospital, ER, or ICU-CCU visit in the 2 days after a missed treatment was compared with the same risk in the 2 days after receiving a hemodialysis treatment. The “at-risk period” was extended to 3 days when the intradialytic period extended over the weekend. At the patient level, the rate of hospital, ER, or ICU-CCU events per patient-year was calculated for participants, stratified by the number of missed treatment days per patient-year. The secondary outcomes of the study were hospitalization or ER visit for urgent inpatient dialysis, hyperkalemia, congestive heart failure, or hypertension (see Supplemental Appendix B). Potential adherence barriers to receiving dialysis care were identified through the review of the dialysis literature2–4 and from studies in the general population such as that by Flores et al., who administered questionnaires focused on barriers to health care to patients.14 The authors of the study were also free to contribute their own hypotheses drawn from their empirical experiences in clinical practice. We further subclassified adherence barriers into patient and systemic barriers. A patient barrier was defined as an individualized factor that could increase the risk for that patient to miss his or her treatment. A systemic barrier was defined as a physical or environmental factor in the health care system or community that could impede a patient from receiving his or her dialysis. Multivariate logistic regression was used to quantify the statistical association for hospitalization, ER visit, and ICU-CCU admission in the 2 days after a missed treatment compared with the 2 days after receiving a hemodialysis treatment (Supplemental Appendix C). The models were covariate adjusted for demographic, dialysis, laboratory, and comorbid parameters abstracted from the database (listed in Table 1). ORs with 95% CIs were derived using a robust sandwich estimator because each patient contributed multiple treatments to the analysis.15 Models were also stratified by the facility to minimize the differences in local practice patterns unique to each dialysis clinic. A secondary logistic analysis was conducted to quantify the association between a missed treatment with 18 patient and systemic barriers that potentially inhibit patients from receiving their dialysis treatment (Supplemental Appendix D). A patient or systemic barrier was present if the parameter was charted or the claim’s date of service (according to the International Classification of Diseases Ninth Revision code) occurred in the period before the outcome. This model was also covariate (listed in Table 1) and sandwich estimator adjusted with stratification for the facility. We also quantified the association of missed treatments on overall hospital and ER utilization. To do this, we performed a patient-level analysis by aggregating treatments within each patient to execute a series of covariate adjusted Poisson models. Hospitalization, ER visits, and ICU-CCU admissions per patient-year were calculated in relation to the number of missed treatment days per patient-year. In our final analyses, we repeated our patient-level Poisson regression to estimate the least-squares means rate of missed treatments, hospitalizations, ER visits, and ICU-CCU admissions in the full population compared with the predicted rates if all patients had perfect transportation to dialysis with no snow days, holiday treatments, psychiatric illness, pain, and gastrointestinal problems.5,16,17 In the case of perfect transportation, the predicted rates were estimated by setting the transportation parameter in the model to self-driven while keeping all other variables in the model constant. Similarly, this was repeated with the other parameters by setting driving time to <7 minutes, snow fall to zero, and zero treatments on holidays. The excess missed treatment, hospitalization, ER visit, and ICU-CCU rate was calculated as the difference between the population mean and the predicted value. For example, this represented the estimated number of hospital days per 100 patient-years that could be saved if all patients received perfect transportation to the dialysis facility. Statistical analyses were executed with SAS software (version 9.3; Cary, NC). In this study, a missed hemodialysis treatment was defined by point-of-care documentation of “no show” at the clinic where the patient was scheduled to receive a treatment; with no Medicare claim for ER service on the date of the missed treatment, no Medicare claim for access thrombosis on the date of the missed treatment; no Medicare claim for hospitalization on the date of the missed treatment; and no Medicare claim for inpatient, outpatient, or home dialysis starting on the date of the missed treatment. However, patients may decide to miss their treatment because of a minor illness, such as diarrhea, which may increase their subsequent risk of hospitalization. To address this and the study’s internal validity, we identified 34,229 missed treatments (4% sample) in clinics with electronic health record charting capabilities. Nursing notes corresponding to the date of the missed treatment were adjudicated by K.E.C., blinded to patient and outcome, to identify missed treatments that were not attributed to minor illness. These reasons included the following: transportation (car broke down, missed ride), personal (no babysitter, funeral, wedding, court date, gone fishing, birthday, work), clinic shutdown (power failure, water problems), and patients who showed up for the treatment but were impatient and left the waiting room before they could be brought into the treatment area. For these specific instances of a missed treatment in which patients were healthy, we recalculated the risk of subsequent hospitalization, ER visit, or ICU-CCU admission compared with patients who received their treatment. K.E.C. and F.W.M. receive salary support from Fresenius Medical Care North America. R.I.T. is a consultant to Fresenius Medical Care North America. The Management Board of Fresenius Medical Care had no role in the design and conduct of this study. This article contains supplemental material online at http://jasn.asnjournals.org/lookup/suppl/doi:10.1681/ASN.2013111160/-/DCSupplemental.